Athens, ca. 449-413 BC. Silver obol. Size : 8.2 x 8.7 mm (a rather small coin) Weight : 0.72 grams. Grade : F with some encrustations. 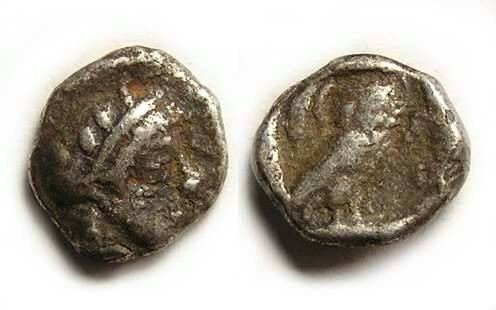 Reverse : Owl standing right, with an olive sprig and crescent moon over its shoulder, with a AQE to the right (only fragments of the inscription are visible).